The lovely patio in front of Brauhaus Schönbuch, complete with giant copper boiler. Brunch is probably my favorite meal because it combines the best of breakfast and the best of lunch at the right time of day. I also love to try lots of flavors, and so buffets really appeal to me. That's why when Brauhaus Schönbuch advertised a brunch buffet, I decided to give it a shot. I've been to Brauhaus Schönbuch several times now. They are conveniently open midday until 1:00 on the weekends and have tons of space for large groups of people. They're also located centrally in the Mitte, but just off a side-street from the busy Königstraße, which means the spacious patio is calmer and quiet than the rest of the downtown area. As the name implies, Brauhaus Schönbuch is a brewery. They make their own beers, they have German-style food, and the inside of the restaurant follows a beer hall-style layout with long wooden tables and benches. They pack a lot of people into an open space, which is part of the appeal and the uniqueness of the German beer hall experience. The inside has a modern design, but sports traditional, long beer hall-style tables. As the weather was slightly schizophrenic today, our large group decided to sit inside the lovely beer hall to avoid the threatening downpour. The brunch buffet, which was set up inside by the bar, had two stations. One station served the traditional German breakfast items (breads, jams, cold cuts, cheese, müsli, yogurt, and fruit), as well as more international items (scrambled eggs, bacon, sausages, fried potatoes, and smoked salmon). The second station served hot items, including a curry chicken dish, salmon in a cream sauce, fried mashed potato balls, herbed rice, and steamed vegetables. There was also an ice cream bar for dessert and a drinks station with coffee, tea, juice, and (best of all) beer! Today I decided to forgo the formality of courses, and filled my plate with all of my favorites: country ham and cheese, smoked salmon with fresh horseradish, scrambled eggs, bacon, two different kinds of sausages, a hash brown, fried mashed potato balls, and a croissant with Nutella. I also decided to try the salmon and the chicken curry from the hot station. Apart from the two things I had at the hot station, which were just okay, the others were delicious. The scrambled eggs were particularly good -- fluffy and moist. I also liked the little details, like the fact that the smoked salmon came with fresh horseradish and the lovely butterflied pickle that served as the only green (kind of) vegetable on my plate. Sadly, I could not handle more than one large plate of food, so I decided to end my meal with a dessert of fresh pineapple and ice cream. They serve Mövenpick ice cream at Brauhaus Schönbuch, which is a very good brand of ice cream in Germany. Today I tried the mango and walnut ice creams, which were both delicious. 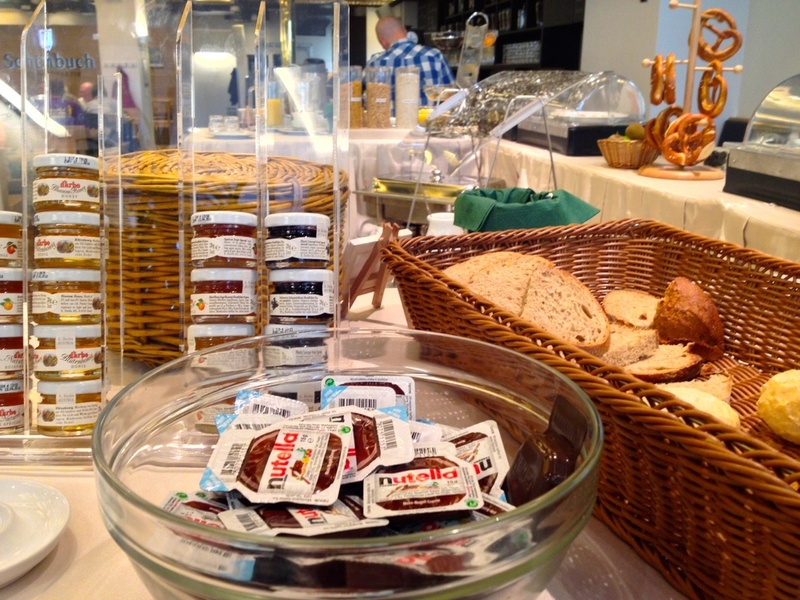 The brunch buffet is 24,50€ per person, which is a little much except for the fact that you get unlimited beer! They set out a keg of their pils, and you can help yourself until the buffet closes at 3:00 pm. Of course you can also order from their regular menu, which includes all of their draft and bottled beers (I also tried the hefeweizen dunkel -- yum!). On another occasion some friends and I also ordered one of their kegs, which look so cool when they're brought to the table and offer a more convenient drinking option when you're with a group. I've found their regular food menu to be pretty good as well, including hearty soups and salads and traditional southern German meals like schnitzel, spätzle, and maultaschen. I particularly like their brotzeitteller (a platter of meats and cheeses served with bread for a snack) and their ofenkartoffel (oven fries with an herb dip). A friend of mine also ordered a delicious-looking baked potato, which is surprisingly popular at steak houses and beer halls in Germany given that they don't really sell russet potatoes in the grocery stores, making real American-style baked potatoes somewhat impossible to make at home. Brauhaus Schönbuch is located at Bolzstraße 10, just a two minute walk from the Schlossplatz U-bahn stop. Their menu includes all of their items in English, so the restaurant is very friendly for non-German speakers. You can also easily make reservations online through opentable, although they have tons of seating if you just want to show up. I can now recommend both their brunch as well as their regular day-menu, and of course, go for the beer hall experience! Tip: Go in the summer when the weather is nice and sit on the patio if you can. If you go in the next couple of weeks, you can also enjoy the World Cup games on their large-screen TV!